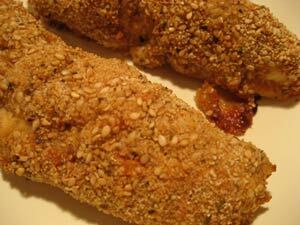 Sesame Chicken Strips, Thyme for Cooking gourmet menus. An oriental dinner that's not a stir-fry. It's still easy, though.... I cut the chicken breasts in half the long way to speed up baking time. We use peanut butter and Teriyaki sauce all through the summer. I love the flavor a little peanut butter adds to a stir-fry. 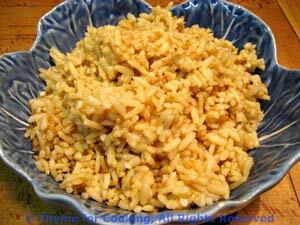 If you don't normally have it on hand you can leave it out - but add another tsp soy sauce. This is a cross between a stir-fry and a salad. Heat oil in a large nonstick skillet. Add cabbage, carrot and celery. Stir-fry 5 - 8 minutes, until cabbage start to wilt. Add soy sauce and chicken stock. Stir well to combine, cover, reduce heat and let cook for 5 more minutes. Combine peanut butter and vinegar. Uncover cabbage and increase heat. Stir in peanut butter/vinegar mixture. 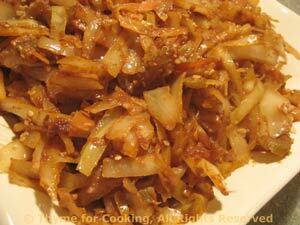 Continue cooking and stirring until most of the liquid has evaporated and peanut butter melted into the cabbage.